The Alerts icon is located at the top right side of the screen. This icon displays the number off all unread alerts for all objects of the currently logged in user. Number in the bottom right corner of the icon shows how many unread alerts currently exist. Unread – Displays only unread alerts. 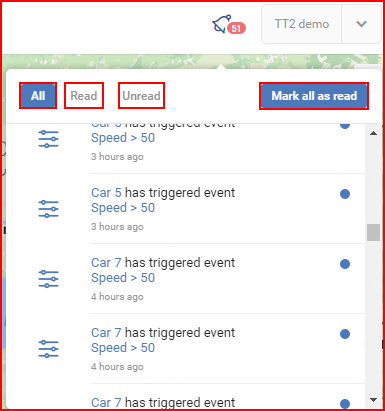 A “Mark all as read” button is present to the right of the filters. Different color codes are used to separate alarms into 2 groups. The map will zoom in to the spot where the event was triggered. The event panel is fully described in the “Events menu” section.